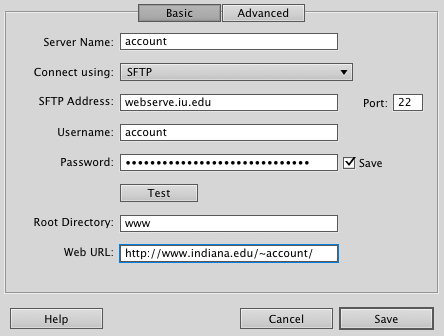 Follow these instructions to set up Dreamweaver via Adobe Creative Cloud to work with your Webserve site. For more about Creative Cloud, see Get started with Adobe Creative Cloud. In the "Site" window, under "Site Name:", enter the name of your account. Under "Local Site Folder:", choose where you want to store the files locally. At the top, click Advanced. 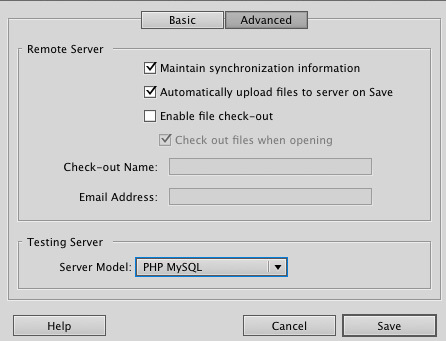 If you want files uploaded to the server when they are saved, check "Automatically upload files to server on Save". Otherwise, leave it unchecked and click Save. When you create a new file in Dreamweaver and try to view the page using a web browser, you may get a 403 Forbidden error message. This is likely because the file permissions are set so that the files are not world readable (either 600 or 700). To fix the 403 error, change the file permissions to 644 and directory permissions to 711. For more, see Change permissions for a file in Unix. To prevent this error, set the default permissions for newly created directories and files in your Webserve account. For more, see Set the default protection to newly created directories and files in Unix. This is document bfog in the Knowledge Base. Last modified on 2019-03-20 11:47:31.